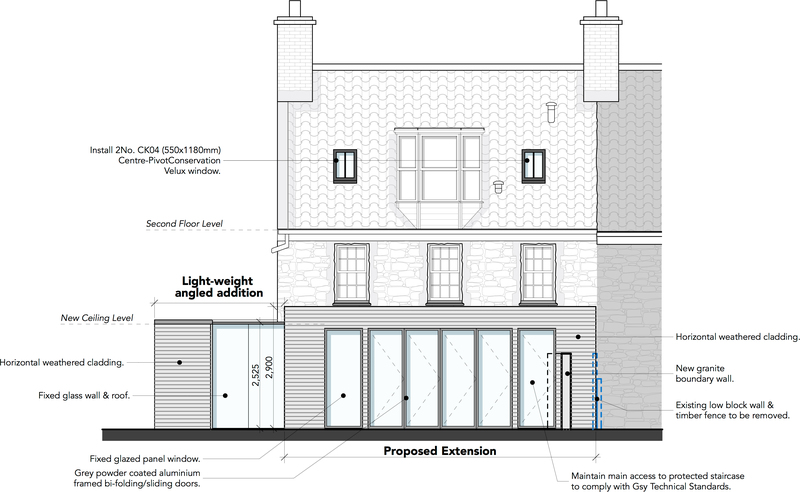 We have recently gained planning permission for a single storey extension at La Petite Ferme. Creating a modern style flat roof extension to the front of this traditional two-storey granite house was a challenging planning process to avoid harming the appearance of the existing dwelling and considering the character and appearance of the wider area. Incorporating large amounts of glass to the front elevation will flood natural light into the new kitchen dining space. From back to front, openings have been lined to link the living space directly with a terrace – ideal for entertaining – which will step up towards the lawned garden. A clean modern twist on a beautiful traditional dwelling.